It was last year when I was told that the Sundown Singapore Marathon’s 10th Anniversary special rate and 2XU early birds’ special rate with additional polo T-shirt giveaway for the loyal runners of Year 2015 and 2016. The race dates of both runs were just a week apart. My friend and I were discussing whether to join both of the marathons. However, with the race date so close to each other, I was not confident enough to run both half marathons. Neither my friend did. Then, we both decided to run for 10KM for Sundown Marathon and 21.1KM for 2XU. We both registered ourselves on the same day and same time. 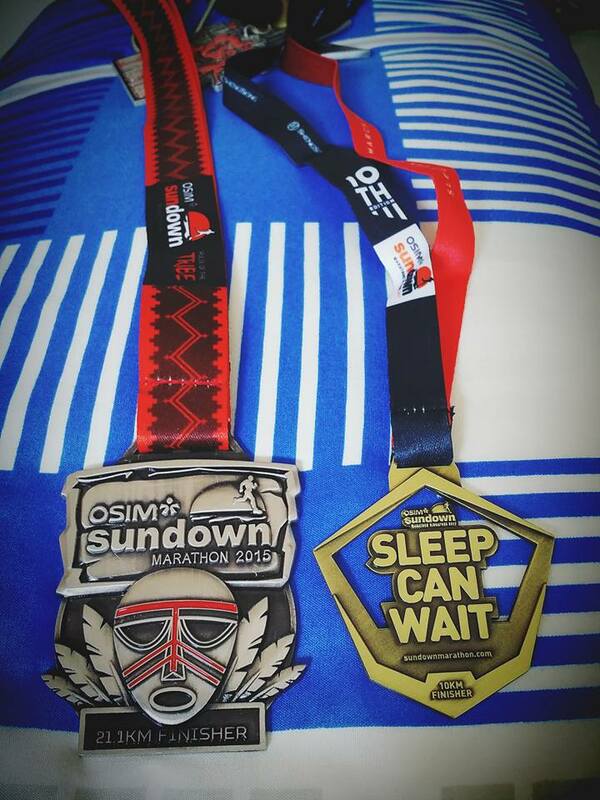 Since, I have run for Sundown’s half marathon in year 2015 (For the Tribe), so it would be good enough for me to run a 10KM this year just to complete the medal collection. 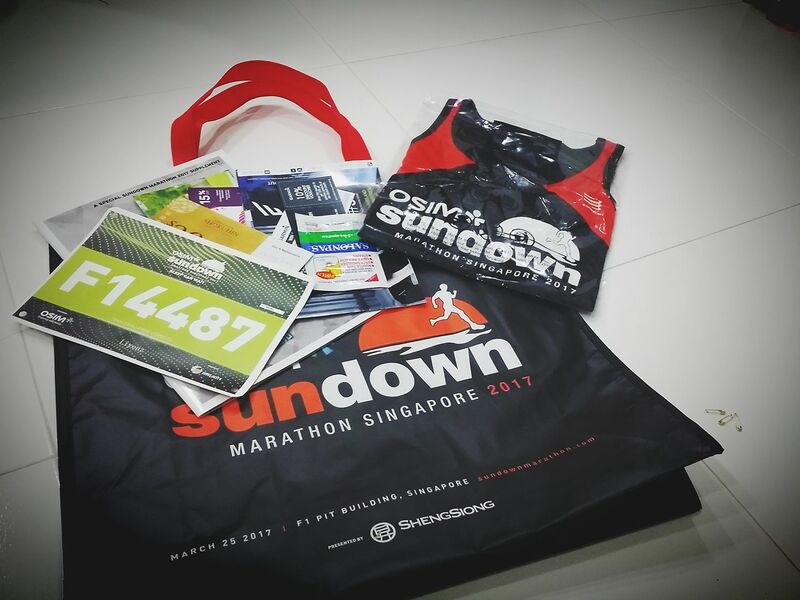 I would not be able to get the Sundown’s finisher T-shirt because it is meant for full marathon. Meanwhile, for 2XU, it is only those who signed up for 21.1KM half marathon would be entitled for the additional polo T-shirt and that was their highest category for 2XU marathon. Another surprised gift was a pair of sock for those super early birds. I think it was just to lure more people to sign up 2XU than Sundown. And, I was definitely going for half marathon to get my 2XU’s finisher T-shirt for this year which was in rose gold lining and black in colour. I got my first 2XU’s finisher T-shirt in Year 2015 which was in yellow lining and black in colour. 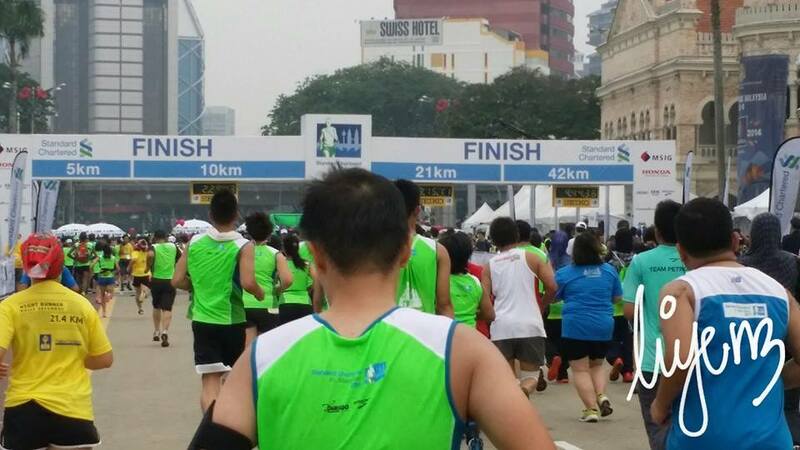 I came down to Singapore just to run these two marathons and reached Singapore in the evening of Friday, 24th March. I went to the Marina Square with hope that I could collect the race pack for 2XU but I was told the queue was very long and wasting time. Yet, indeed it was and I gave up, then walked to the F1 Pit Building to collect the Sundown’s race pack instead. There was queue too and my side was pretty slow. There was a lot of bad comments about Sundown’s management for this year event especially on the poor management of the race pack collection. As for myself, the queue was fairly okay because I spent 1.5 hours before my turn. However, I was pretty sad with the medal’s quality when I compared to the Year 2015’s finisher medal. 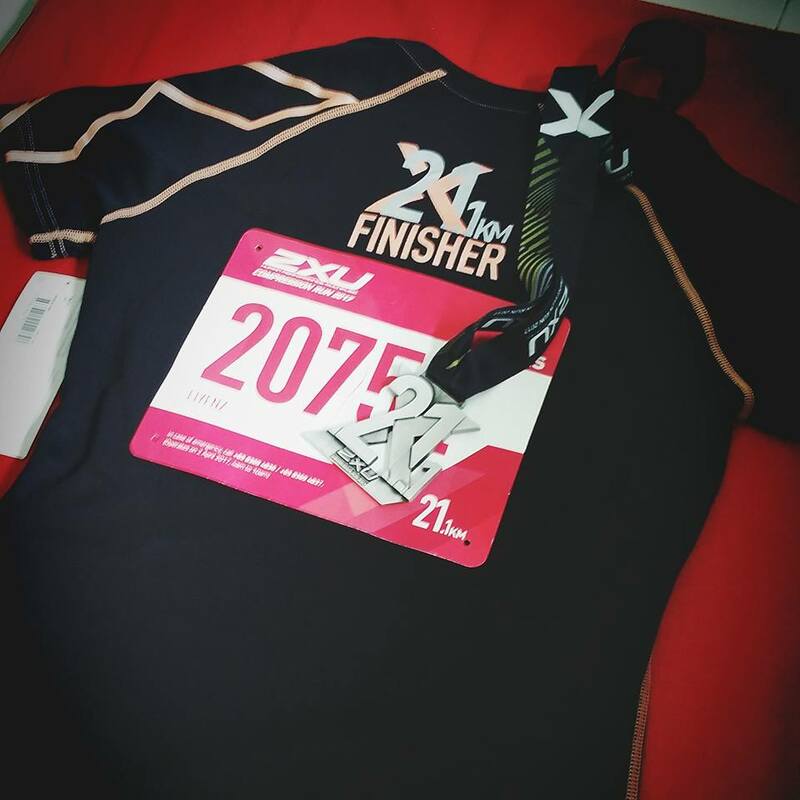 Let me show you the finisher T-shirt and the medal for the 2XU Marathon Year 2017. I will update my post with a picture of both finisher T-shirt in which I personally prefer the cutting and design of the past year. 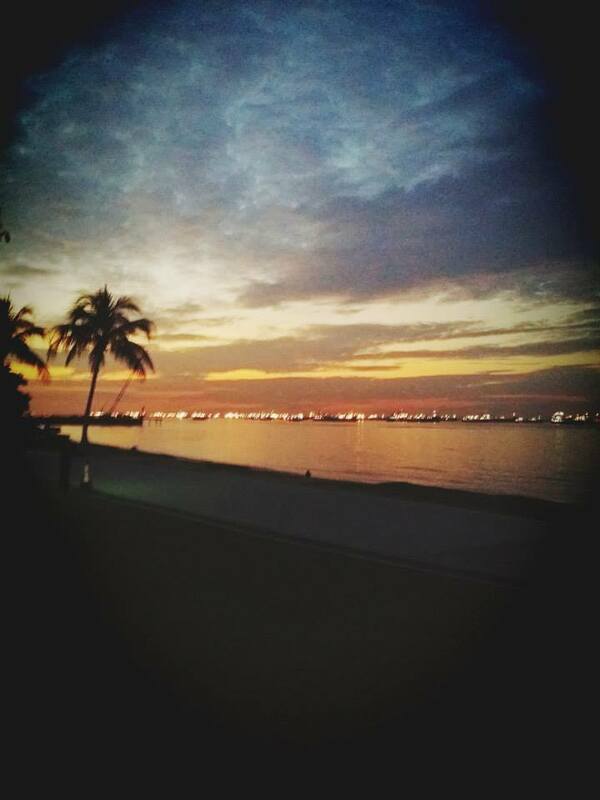 People have been asking what my reasons for paying so much and joining the marathons after all, there are many parks in Singapore which are free to run and also there are many park connectors which allow us to run for kilometers without a cost. Not only that, sometimes, you will see people join the Spartan race. Why? To be honest, I do not have an answer which can tell people, the greatest of joining the marathons. It is some sort of suffer whenever I have to run 10KM or more, I would think that I can just easily give up my run after 5KM or 6KM on my normal running routine. Then, why? I think my answer will be, the satisfaction of running toward the finishing line while people around are cheering up for you to push harder for the next 10 meters or so. I think it is all about the sportsmanship’s spirit that I can feel when I run toward the finishing line. The shouts from those strangers who have the same aims and goals as us motivate me to push to my max limit to cross the line with my best timing. Oh well, it is worth to do it when it is just for a short 10 meters distance? Hmm, well I do not have a perfect answer too but it is worth especially when you get extra bonus such as being the top 3 winners, winning prize from lucky draw if any or get to know a new friend who has the same hobby as you. 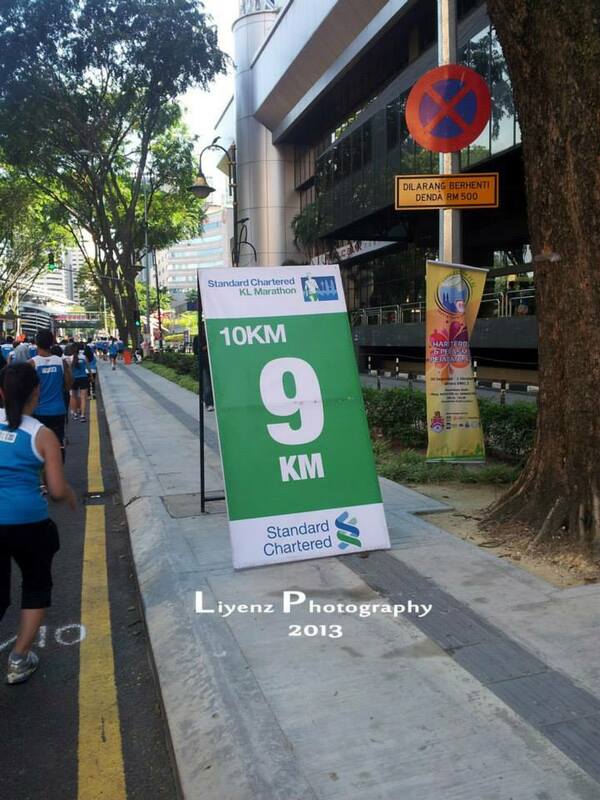 Back in Year 2014 during the Standard Chartered KL Marathon, I met a new friend who run for 10KM too at the 9KM signage board. As an amateur runner, I loved to stop by to take pictures and post to Instagram, this is one of those pictures I took during the run. And, I do love the feeling after the marathons, especially the time when i organize my medals and think about how to display my hall of fame. Yes, some people may say, medals, trophies and certifications can be custom-made outside but what the fun is? You must go through all the obstacles, sweats and the pain after the marathon before you can understand the greatest of running a marathon. There is always a lesson to be learned from each run and a beautiful reward awaiting us in front, the sunrise (the beginning of new day).